For other uses, see Mission: Impossible (disambiguation). Mission: Impossible was a commercial success upon its release, eventually becoming the third highest-grossing film of 1996, and received a mostly positive response from critics. Its success spawned the Mission: Impossible film series. Jim Phelps and his team, the Impossible Missions Force (IMF), are dispatched to stop the theft of the CIA non-official cover (NOC) list from the American embassy in Prague. 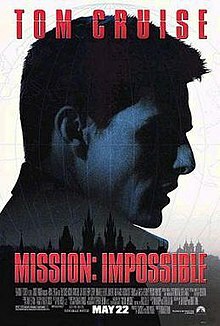 Their mission fails: the list is stolen, Phelps is shot, his wife Claire dies in a car bombing, and the rest of the team except Ethan Hunt are eliminated by unknown assassins and supposed tech malfunctions. Meeting with IMF director Eugene Kittridge, Hunt reveals his awareness of a second IMF team sent to monitor them, and learns the job was a setup to lure out a mole within the IMF, who is believed to be working with an arms dealer known as "Max" as part of "Job 314." As Hunt is the only member left, Kittridge suspects him of being the mole, and Hunt flees. Returning to the Prague safe house, Hunt realizes "Job 314" refers to Bible verse Job 3:14, "Job" being the mole's code name. Claire arrives at the safe house, explaining she escaped the bomb after Phelps aborted the mission. Hunt arranges a meeting with Max, and warns her that she has been given a fake list on a disc equipped with a tracking device. He promises to deliver the real list in return for $10 million and Job's identity. Max and her agents escape, taking Hunt with them, just before a CIA team raids their location. Hunt and Claire recruit two disavowed IMF agents: computer expert Luther Stickell and pilot Franz Krieger. They infiltrate CIA headquarters in Langley, steal the real list, and flee to London. Kittridge, detecting the theft, has Hunt's mother and uncle falsely arrested for drug trafficking. He provides media coverage of the arrest, forcing Hunt to contact him from Liverpool Street Station. Hunt allows the CIA to trace him to London before hanging up, but is surprised to find Phelps nearby. Phelps recounts surviving the shooting, naming Kittridge as the mole. Hunt realizes Phelps is the mole, having stolen a Bible with a Gideon stamp from Chicago's Drake Hotel during a previous assignment known to Hunt's team. Hunt also suspects Krieger as the one who killed the other IMF members in Prague, having recognized his distinctive knife; however, he is unsure whether Claire was involved. Hunt arranges with Max to exchange the list aboard the TGV train to Paris the next day and secretly sends tickets to Kittridge. On the train, Hunt remotely directs Max to the list. Max verifies it and directs Hunt to the baggage car, where he can find both the money and Job. Hunt calls Claire and tells her to meet him there. Meanwhile, Stickell uses a jamming device to prevent Max from uploading the data to her servers. Claire reaches the baggage car, finds Phelps and tells him Hunt will arrive shortly. She questions the idea of killing Hunt, since they will need a fall guy, but Phelps reveals himself to be Hunt in a mask, exposing her as a co-conspirator. When the real Phelps arrives and takes the money at gunpoint, Hunt dons a pair of video glasses that relays Phelps' image to Kittridge, blowing Phelps' cover as the mole. Phelps threatens to kill Hunt, but shoots Claire instead when she intervenes. He climbs to the roof of the train, where Krieger is waiting with a helicopter and a tether. Hunt connects the tether to the train itself, forcing the helicopter into the Channel Tunnel after the train. Hunt places an explosive chewing gum on the helicopter windshield, killing Krieger and Phelps. Kittridge arrests Max and recovers the list, then reinstates Hunt and Stickell as IMF agents. Hunt is unsure about returning to the team, but on the flight home, an attendant uses a coded phrase to ask him if he is ready to take on a new mission. Paramount Pictures owned the rights to the television series and had tried for years to make a film version but had failed to come up with a viable treatment. Tom Cruise had been a fan of the show since he was young and thought that it would be a good idea for a film. The actor chose Mission: Impossible to be the first project of his new production company and convinced Paramount to put up a $70 million budget. Cruise and his producing partner, Paula Wagner, worked on a story with filmmaker Sydney Pollack for a few months when the actor hired Brian De Palma to direct. They went through two screenplay drafts that no one liked. De Palma brought in screenwriters Steve Zaillian, David Koepp, and finally Robert Towne. When the film was green-lit Koepp was initially fired with Robert Towne being the lead writer and Koepp being brought back on later. According to the director, the goal of the script was to "constantly surprise the audience." Reportedly, Koepp was paid $1 million to rewrite an original script by Willard Huyck and Gloria Katz. According to one project source, there were problems with dialogue and story development. However, the basic plot remained intact. The film went into pre-production without a script that the filmmakers wanted to use. De Palma designed the action sequences but neither Koepp nor Towne were satisfied with the story that would make these sequences take place. Towne ended up helping organize a beginning, middle and end to hang story details on while De Palma and Koepp worked on the plot. De Palma convinced Cruise to set the first act of the film in Prague, a city rarely seen in Hollywood films at the time. Reportedly, studio executives wanted to keep the film's budget in the $40–50 million range, but Cruise wanted a "big, showy action piece" that took the budget up to the $62 million range. The scene that takes place in a glass-walled restaurant with a big lobster tank in the middle and three huge fish tanks overhead was Cruise's idea. There were 16 tons in all of the tanks and there was a concern that when they detonated, a lot of glass would fly around. De Palma tried the sequence with a stuntman, but it did not look convincing and he asked Cruise to do it, despite the possibility that the actor could have drowned. The script that Cruise approved called for a final showdown to take place on top of a moving train. The actor wanted to use the famously fast French train the TGV but rail authorities did not want any part of the stunt performed on their trains. When that was no longer a problem, the track was not available. De Palma visited railroads on two continents trying to get permission. Cruise took the train owners out to dinner and the next day they were allowed to use it. For the actual sequence, the actor wanted wind that was so powerful that it could knock him off the train. Cruise had difficulty finding the right machine that would create the wind velocity that would look visually accurate before remembering a simulator he used while training as a skydiver. The only machine of its kind in Europe was located and acquired. Cruise had it produce winds up to 140 miles per hour so it would distort his face. Exterior shots of the train were filmed on the Glasgow South Western Line, between New Cumnock, Dumfries and Annan. Most of the sequence, however, was filmed on a stage against a blue screen for later digitizing by the visual effects team at Industrial Light & Magic. The filmmakers delivered the film on time and under budget, a rarity in Hollywood, with Cruise doing most of his own stunts. Initially, there was a sophisticated opening sequence that introduced a love triangle between Jim Phelps, his wife Claire and Ethan Hunt that was removed because it took the test audience "out of the genre", according to De Palma. There were rumors that the actor and De Palma did not get along and they were fueled by the director excusing himself at the last moment from scheduled media interviews before the film's theatrical release. The film uses Lalo Schifrin's original "Theme from Mission: Impossible". Originally, Alan Silvestri was hired to write the film's score and had, in fact, recorded somewhere around 23 minutes of the score. During post-production, due to creative differences, Silvestri's music was rejected and replaced with new music by composer Danny Elfman. According to some sources, the decision to replace Silvestri was made by producer Tom Cruise. U2 bandmates Larry Mullen, Jr. and Adam Clayton were fans of the TV show and knew the original theme music well, but were nervous about remaking Schifrin's legendary theme song. Clayton put together his own version in New York City and Mullen did his in Dublin on weekends between U2 recording sessions. The two musicians were influenced by Brian Eno and the European dance club scene sound of the recently finished album Passengers. They allowed Polygram to pick its favorite and they wanted both. In a month, they had two versions of the song and five remixed by DJs. All seven tracks appeared on a limited edition vinyl release. The song entered the top 10 of music charts around the world, was nominated for the Grammy Award for Best Pop Instrumental Performance in 1997, and was a critical and commercial success. Apple Computer had a $15 million promotion linked to the film that included a game, print ads and television spot featuring scenes from the TV show turned into the feature film; dealer and in-theater promos; and a placement of Apple personal computers in the film. This was an attempt on Apple's part to improve their image after posting a $740 million loss in its fiscal second quarter. Several cast members of the original 1966–73 TV series reacted negatively to the film. Actor Greg Morris, who portrayed Barney Collier in the original television series, was reportedly disgusted with the film's treatment of the Phelps character, and he walked out of the theater before the film ended. Peter Graves, who played Jim Phelps in the original series as well as in the late-1980s revival, also disliked how Phelps turned out in the film. Martin Landau, who portrayed Rollin Hand in the original series, expressed his own disapproval concerning the film. In an MTV interview in October 2009, Landau stated, "When they were working on an early incarnation of the first one — not the script they ultimately did — they wanted the entire team to be destroyed, done away with one at a time, and I was against that. It was basically an action-adventure movie and not Mission. Mission was a mind game. The ideal mission was getting in and getting out without anyone ever knowing we were there. So the whole texture changed. Why volunteer to essentially have our characters commit suicide? I passed on it ... The script wasn't that good either!" Mission: Impossible opened on May 22, 1996 in 3,012 theaters—the most ever up to that point—and broke the record for a film opening on Wednesday with US$11.8 million, beating the $11.7 million Terminator 2: Judgment Day made in 1991. The film also set house records in several theaters around the United States. Mission: Impossible grossed $75 million in its first six days, surpassing Jurassic Park, and took in more than $56 million over the four-day Memorial Day weekend, beating out The Flintstones. Cruise deferred his usual $20 million fee for a significant percentage of the box office. The film went on to make $180.9 million in North America and $276.7 million in the rest of the world for a worldwide total of $457.6 million. Mission: Impossible received mainly positive reviews from critics. The film has a 64% approval rating on Rotten Tomatoes, based on 52 reviews, with an average rating of 6/10, with the critical consensus reading, "Full of special effects, Brian DePalma's update of Mission: Impossible has a lot of sweeping spectacle, but the plot is sometimes convoluted". On Metacritic, the film has a score of 59 out of 100, based on 29 reviews, indicating "mixed or average reviews". Chicago Sun-Times film critic Roger Ebert gave the film three out of four stars and wrote, "This is a movie that exists in the instant, and we must exist in the instant to enjoy it." In his review for The New York Times, Stephen Holden addressed the film's convoluted plot: "If that story doesn't make a shred of sense on any number of levels, so what? Neither did the television series, in which basic credibility didn't matter so long as its sci-fi popular mechanics kept up the suspense." Mike Clark of USA Today gave the film three out of four stars and said that it was "stylish, brisk but lacking in human dimension despite an attractive cast, the glass is either half-empty or half-full here, though the concoction goes down with ease." However, Hal Hinson, in his review for The Washington Post, wrote, "There are empty thrills, and some suspense. But throughout the film, we keep waiting for some trace of personality, some color in the dialogue, some hipness in the staging or in the characters' attitudes. And it's not there." Time magazine's Richard Schickel wrote, "What is not present in Mission: Impossible (which, aside from the title, sound-track quotations from the theme song and self-destructing assignment tapes, has little to do with the old TV show) is a plot that logically links all these events or characters with any discernible motives beyond surviving the crisis of the moment." Writing for Entertainment Weekly, Owen Gleiberman gave the film a "B" rating and said, "The problem isn't that the plot is too complicated; it's that each detail is given the exact same nagging emphasis. Intriguing yet mechanistic, jammed with action yet as talky and dense as a physics seminar, the studiously labyrinthine Mission: Impossible grabs your attention without quite tickling your imagination." Mission: Impossible was released by Paramount Home Video on VHS on November 12, 1996 and DVD on January 17, 1998. The film was released on DVD again on April 11 2006, as a special collector's edition. A Blu-ray release followed on June 3 2008, a 4K UHD Blu-ray version was released on June 26 2018, offering upgraded picture and audio. ^ "Mission: Impossible". American Film Institute. Retrieved May 22, 2017. ^ "MISSION IMPOSSIBLE (PG)". British Board of Film Classification. May 20, 1996. Retrieved August 2, 2015. ^ a b "Mission: Impossible (1996)". Box Office Mojo. Retrieved 2015-08-01. ^ Foutch, Haleigh (May 22, 2016). "'Mission: Impossible' 20 Years Later: How An Uneasy Spy Thriller Became a Blockbuster Franchise". Collider. Retrieved July 17, 2018. ^ a b c Portman, Jamie (May 18, 1996). "Cruise's Mission Accomplished". The Gazette. Montreal. p. E3. ^ a b c d e f g Penfield III, Wilder (May 19, 1996). "The Impossible Dream". Toronto Sun. p. S3. ^ a b c d e f g Green, Tom (May 22, 1996). "Handling an impossible task A 'Mission' complete with intrigue". USA Today. p. 1D. ^ Baumbach, Noah; Jake Paltrow (September 9, 2015). De Palma (Motion picture). A24. ^ a b Brennan, Judy (December 16, 1995). "Cruise's Mission". Entertainment Weekly. ^ Wolff, Ellen (May 22, 1996). "Mission Uses Sound of Silence". Variety. ^ Thaxton, Ford A.; Larson, Randall D. (2000). "Composer Alan Silvestri Disavowed". Soundtrack Magazine. EU: Runmovies.eu. 19 (74). ^ a b Gunderson, Edna (May 15, 1996). "U2 members on a 'Mission' remix". USA Today. p. 12D. ^ Enrico, Dottie (April 30, 1996). "Apple's mission: Hollywood Computer ads take new turn". USA Today. p. 4B. ^ "Interview with Maggie Q". CNN. November 14, 2007. Archived from the original on July 9, 2012. ^ Thomas, Karen (May 24, 1996). "'Mission' is successful, breaks Wednesday record". USA Today. p. 1D. ^ Hindes, Andrew (May 24, 1996). "Mission Cruises to B.O. Record". Variety. p. 1. ^ a b Weinraub, Bernard (May 28, 1996). "Cruise's Thriller Breaking Records". The New York Times. p. 15. ^ "Mission: Impossible". Box Office Mojo. Retrieved 2008-07-16. ^ "Mission: Impossible (1996)". Rotten Tomatoes. Retrieved 2015-08-01. ^ "Mission: Impossible Reviews". Metacritic. Retrieved 2015-08-01. ^ Ebert, Roger (May 31, 1996). "Mission: Impossible". Chicago Sun-Times. Retrieved 2008-07-15. ^ Holden, Stephen (May 22, 1996). "Mission: Impossible". The New York Times. Retrieved 2008-07-15. ^ Clark, Mike (May 22, 1996). "Should you decide to accept it, plot works". USA Today. p. 1D. ^ Hinson, Hal (May 22, 1996). "De Palma's Mission Implausible". The Washington Post. Retrieved 2008-07-15. ^ Schickel, Richard (May 27, 1996). "Movie: Improbable". Time. Retrieved 2009-05-21. ^ Gleiberman, Owen (May 31, 1996). "Mission: Impossible". Entertainment Weekly. Retrieved 2009-05-21. ^ "Mission: Impossible DVD Release Date". DVDs Release Dates. Retrieved 2018-05-02. This page was last edited on 14 April 2019, at 18:30 (UTC).